Our tree is lovely from just about anywhere in the living room, but there’s one spot just perfect for viewing and being cozy. 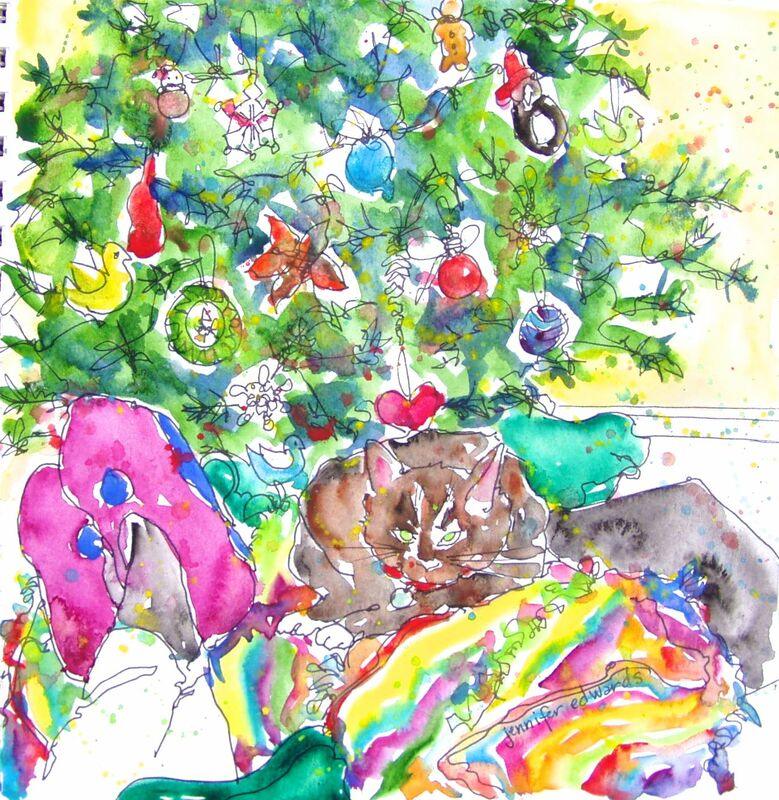 I found myself there this morning, enjoying for a few minutes the glow of the tree, the curled up kitty on one of my crocheted afghans, and the last moments of being in my comfy jammies and felted slippers. These moments are all too fleeting these days. Are you feeling the pinch too? After the tranquility of the early morning perfect spot, I found myself apologizing to Maddie on the way to take her to school this morning for being so short fused as we hustled and bustled to get ready. It’s not pretty. I told her I felt like someone with a plate of food that is piled so high it’s oozing off the plate. She said, “Eeew!” Then she asked, “Does it feel like, when you eat it, that it’s coming out your ears?” I said yes, and my nose and my eyeballs. It’s no excuse for treating my kids gruffly. It’s one of those nasty things about the holidays…the busyness can turn me into the Grinch. Oh how I need to draw and draw and pray and draw and have my heart rearranged! Maybe I can visit my perfect spot again tomorrow! Wish I could be there with you. Lovely! I love the looseness. Your perfect spot looks warm and lovely. I love all the color… It looks like a happy place. Thank you Linda! I hope you can find some creative moments as well! It looks so festive but it’s always a stressy time of year for lots of reasons!